Let me start off by saying that this post was tough, especially knowing that I am NOT computer savvy at all. 😛 I wanted to keep all the photos in my post without “scrimping” on your viewing pleasure, but at the same time, didn’t know if 40 something photos would bore you or eat up my photo allocation on this particular post. My goddaughter, Russia, who is 12 years old, recommended this great application to me which made collages out of the pictures… So now you get to see all the photos neatly arranged in several collages. My head does hurt though…. 😯 hehehe. Thanks Rush! 😀 Love you! 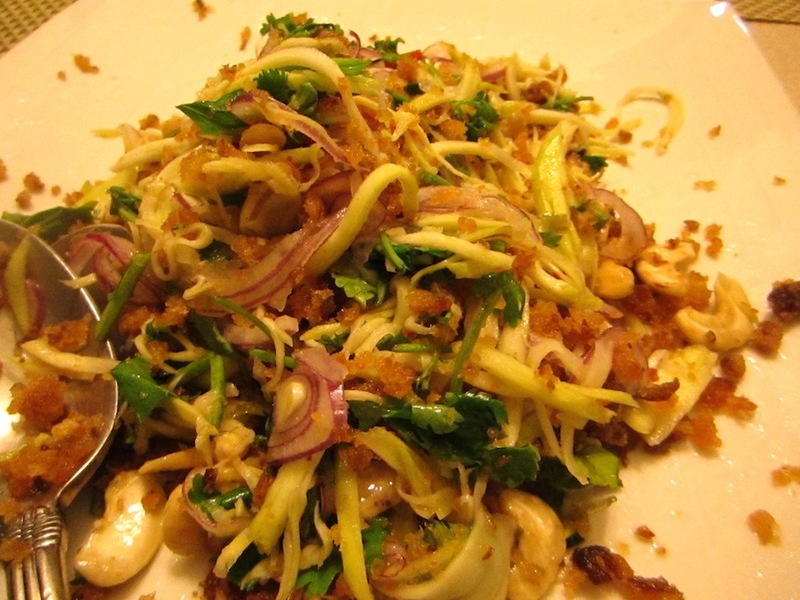 I love Thai Mango Catfish Salad and I order it all the time when I dine in a Thai resto. So….. I figured why not make one at home? Saves me a bundle and I can have it anytime I want. 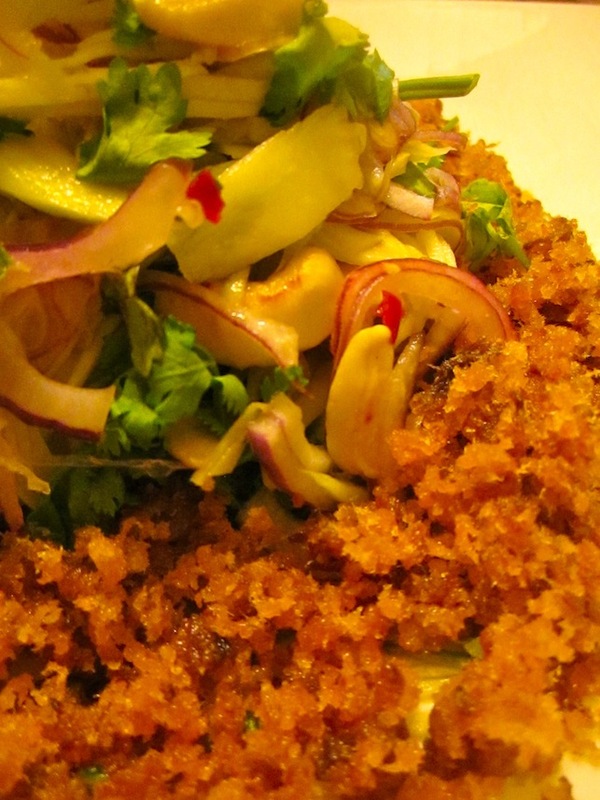 😛 So here’s my take on a Thai Mango Catfish Salad, Pria style 😉 Hope you make this when you have the time. I was so deliscious!!! 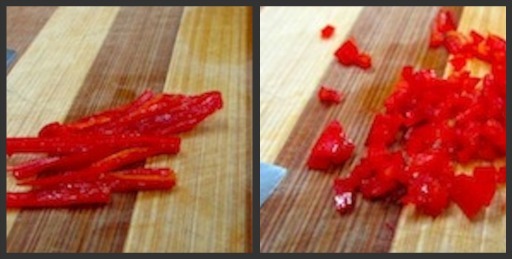 Slice the tops off, of the red chili and cut lengthwise. 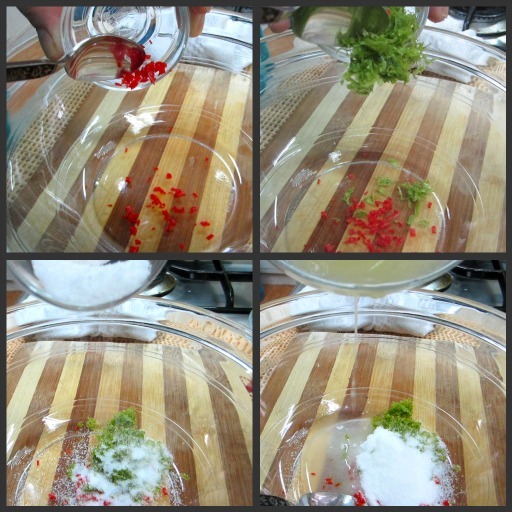 Remove the seeds and white parts. This is where all the heat is at. Be careful! ❗ Please do not rub your eyes and make sure that you wash your hands completely. This can burn even your fingers if your’re not used to it. 😯 Wear gloves if you prefer. 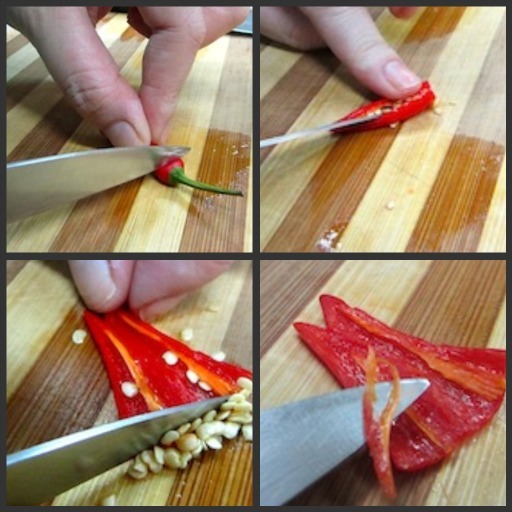 Julienne, or cut them into thin strips and then finely chop the chili. This is the fun part! 😀 I remember my mom’s cook used to do this when I was younger as she prepared our bagoong and green mango salad at home using a criss-cross pattern. I had a light bulb moment 💡 and used the same technique except I kept the cut lengthwise. 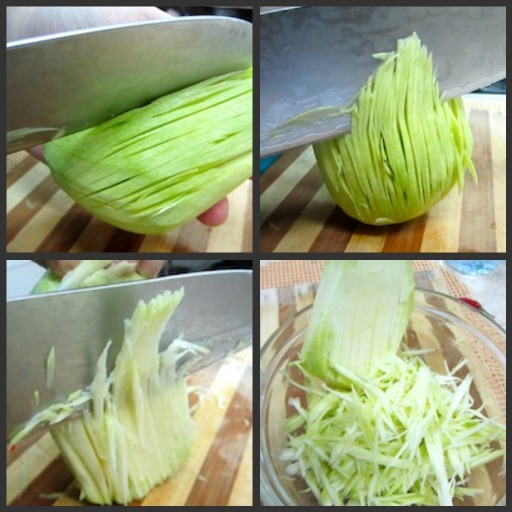 Wash, pat dry and peel the green mango.Using a sharp knife, cut into the green mango until you have achieved fine long slits. 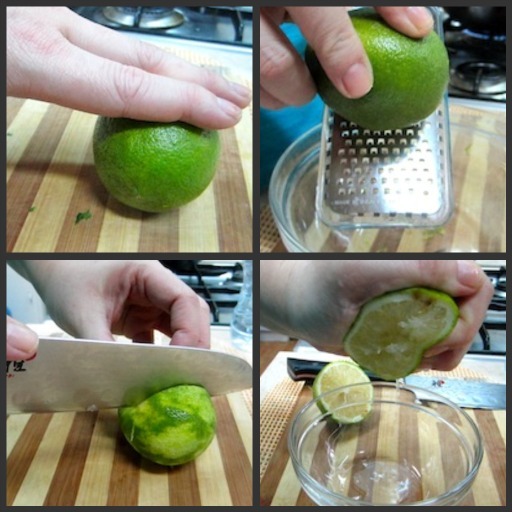 Slice the mango as thin as you can to create julienned pieces. This was tiring, by the way. You need muscles for this one. 😉 Finish this step until you reach the seed. Set aside. 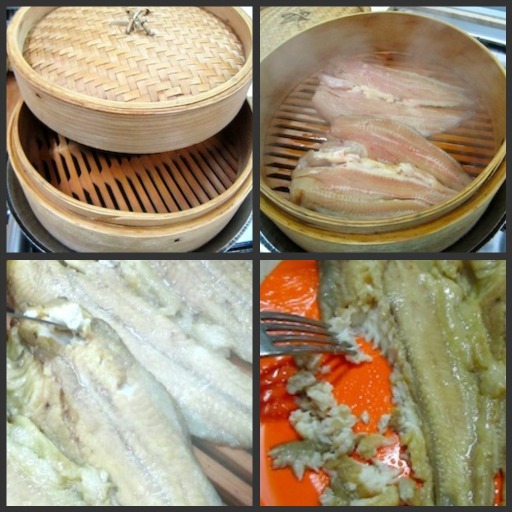 Place water in a wok and nestle a bamboo steamer on top, allow to come to a rolling boil. Add catfish fillets and steam for about 15 minutes. Using a knife, test if the fish flakes off when punctured. Allow to cool and with 2 forks, shred it. Set aside. 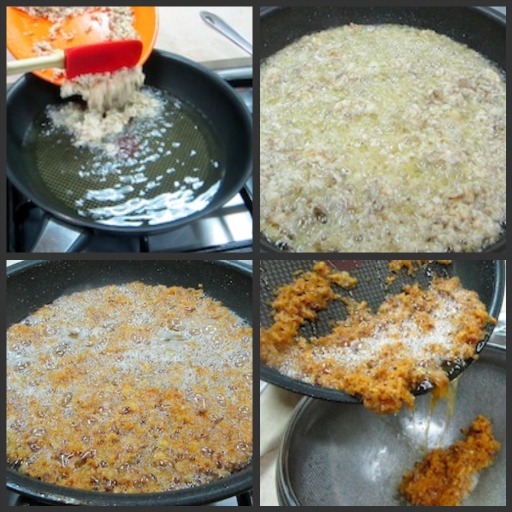 Fry, Fry, Fry until golden and crisp…… Drain. I used canola oil. 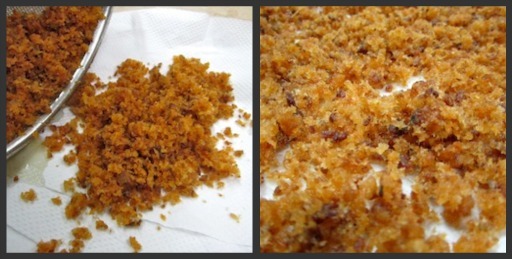 You can use whatever oil you have at home. Drain on paper towels and allow to cool. when cooled, place in an airtight container until ready to serve. 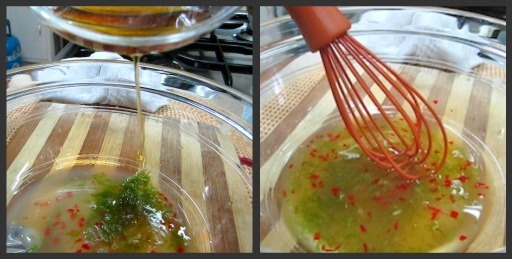 In a bowl, combine the chili, lime zest, sugar, lime juice and fish sauce. Stir to combine. 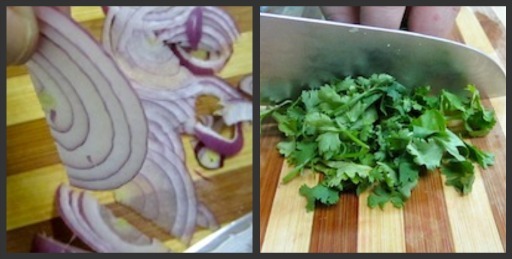 Slice red onions veeery thinly and roughly chop cilantro. 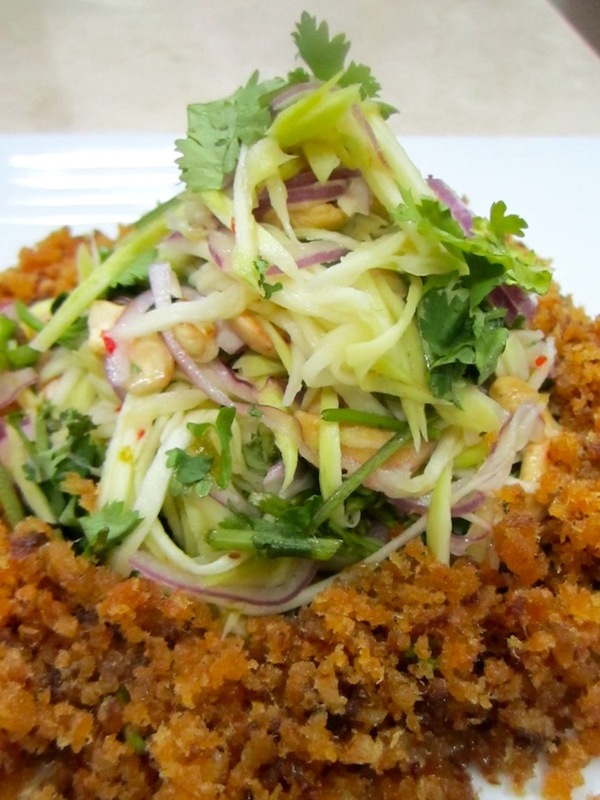 Place shredded mangoes, onions and cilantro in a bowl and pour dressing over top. 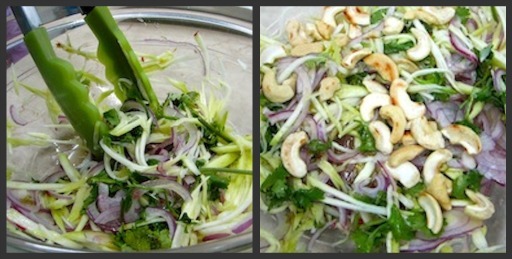 Add toasted cashews and mix to combine. 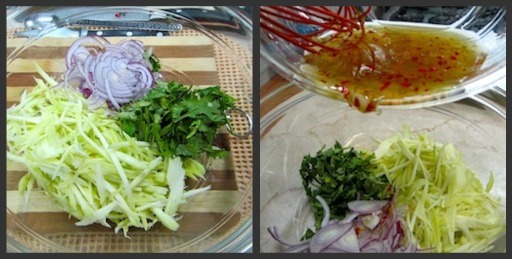 PLATE AND SERVE 😀 I love cilantro, so I placed more fresh cilantro to garnish and finish the dish. Tinsywinsy, pls do and let me know how it turned out 😀 People’s palace does have amazing dishes. Thanks so much, Sands! So happy you enjoy my blog. See you soon! hey chef! 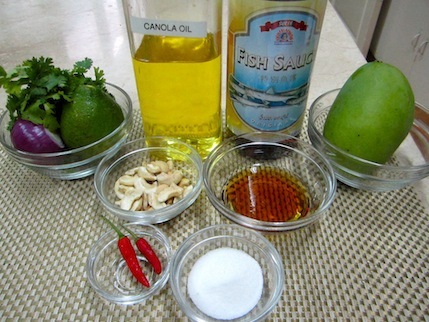 going to try this tonight….what good quality fish sauce can you recommend and where can I find it? 🙂 Thanks!! This is an awesome post, Pri! Wonderful job!…now I’m hungry! Pria, I am going to try that. It sounds awesome. I actually have some catfish in my freezer. I just have to buy mangos.